Pip Davidson. 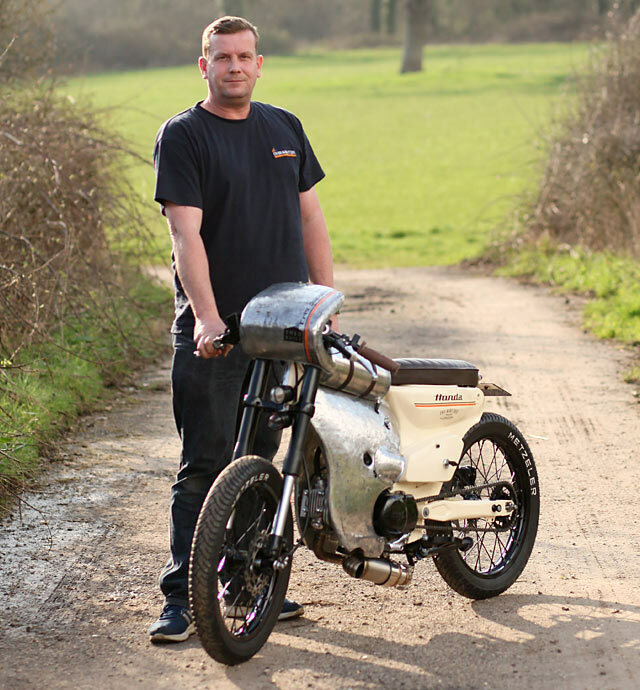 As a man of few words, a self-confessed budget-build-a-holic, lover of small nitrous engines and the colour cream, you can imagine that his bike builds aren’t like most others. Not even a tiny bit. 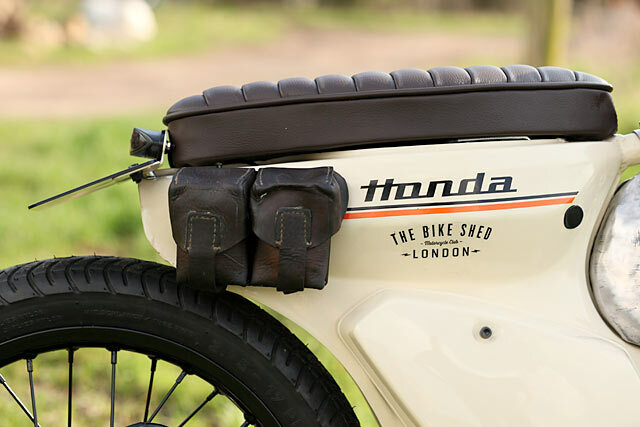 So when he told us his new bike was a faired Honda C90 ‘Speedcub’ racer whose name means ‘strife’, our eyebrows were raised. Needless to say, they were raised again once we saw the bike in question. 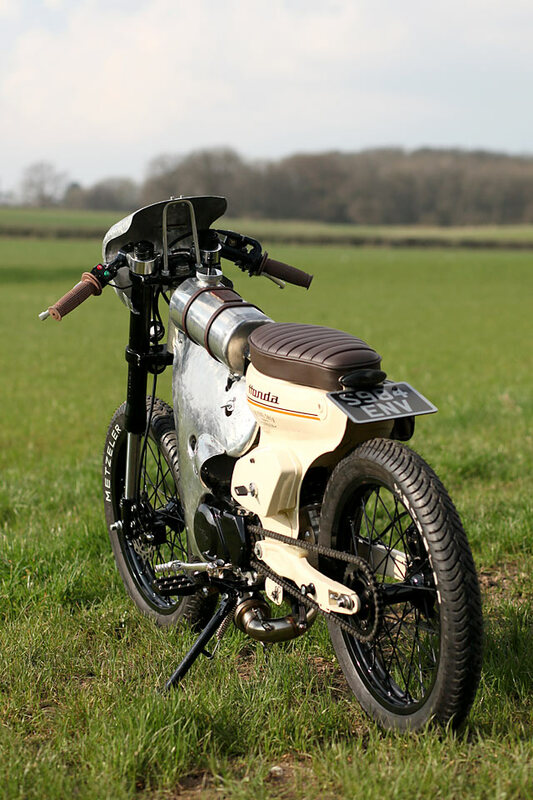 Meet ‘Eris’, a wild custom Honda and the Greek Goddess of discord. 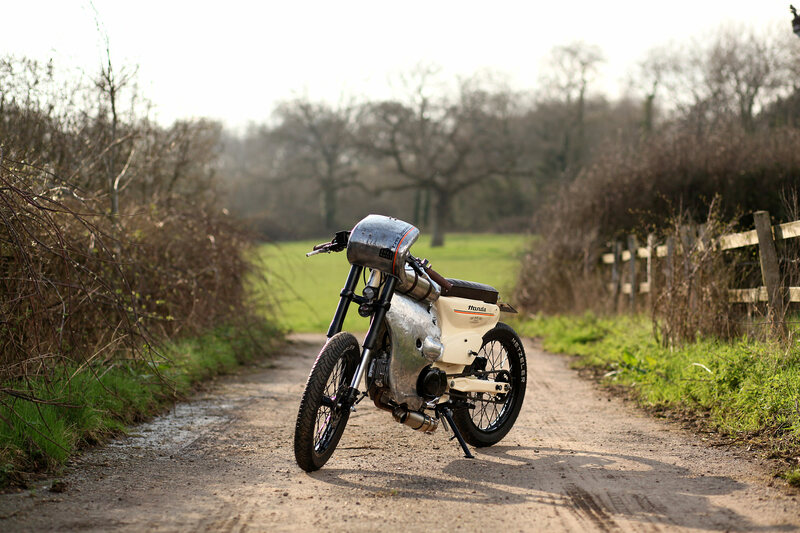 ‘Eris’ is a 1998 Honda Cub C90 that Pip bought for a couple of hundred quid a year or so ago. 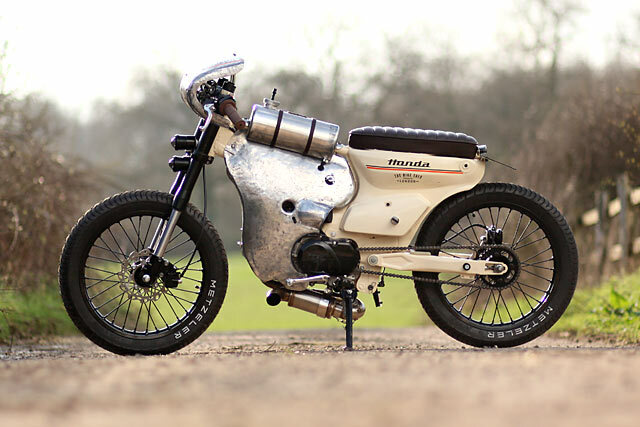 “Since then it’s done pretty much nothing but sit quietly in the corner of my shed, waiting patiently for her turn to be hopped up, painted my signature cream colour and covered her with odd eBay trinkets.” The ‘hopping’ commenced with a 160cc race-tuned engine that was ported, Mikuni’d, ram-aired and freed up to breath on the back-end with a new – and ludicrously beefy – underslung exhaust. 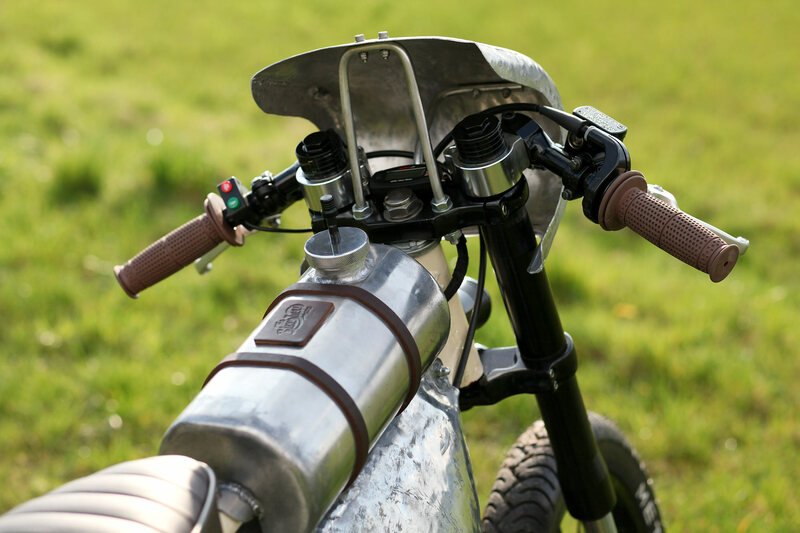 A new pit bike headstock was unceremoniously cut and welded onto the Cub’s frame, along with a new crossbar that was soon to be used to support Pip’s signature ‘top tank’ modifications. The headless pit bike’s USD forks were then added, with Pip modifying the yokes to lower the forks and allow for the new clip-ons to be attached to the excess tubeage above the top triple. 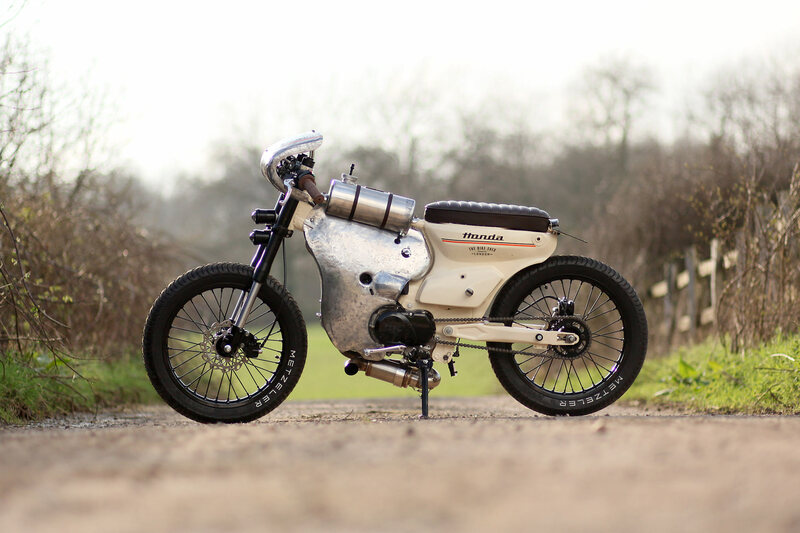 “For the rear shock, a second-hand R1 mono was found on eBay for £40.” To make it fit, Pip modified the Honda’s frame where the fuel tank had previously resided and welded some new brackets to allow it to be mounted in the correct position. Of course, the swingarm was also modded and bracketed, too. But the shock wasn’t the only thing that was now calling the bike’s underseat area home. A new, hand-made loom with all the necessary electrics had also moved in. 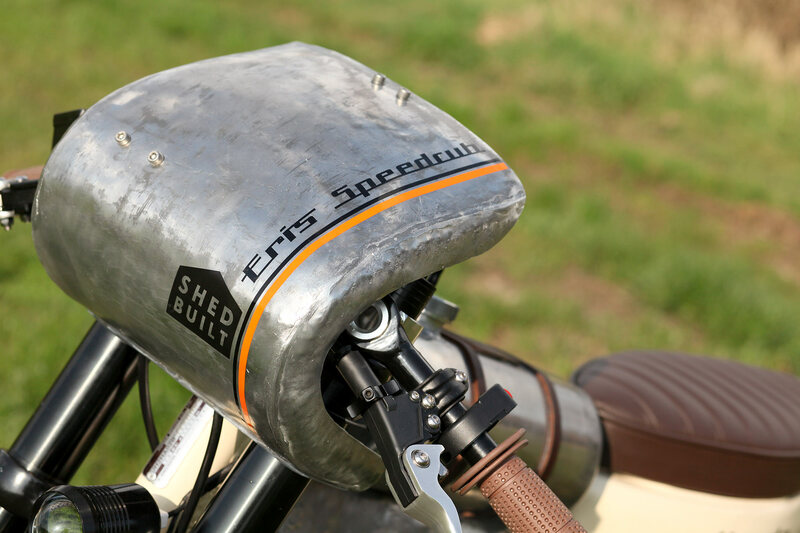 The racer’s distinctive and hand-beaten aluminium side covers and bikini fairing were brutally fashioned from a sheet of 1.6mm 1050AH14-grade aluminum. 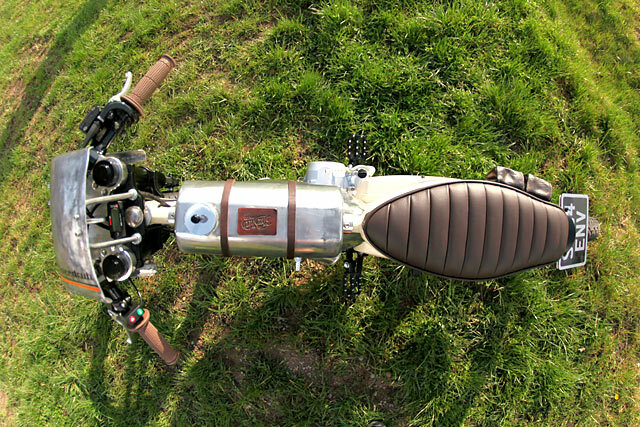 The side panels are fixed onto the bike’s engine bolts, with various holes added for the fuel, air filter and the like. The bikini fairing is held to the yokes with a 6mm alloy bar that was hand bent to provide the suitable support. 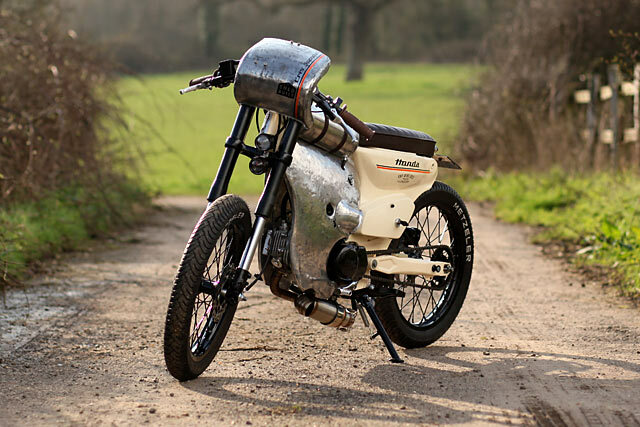 “Then various eBay trinkets, including a gear lever, switches and front and rear lights, were purchased, modified to look good and bolted on to the bike. 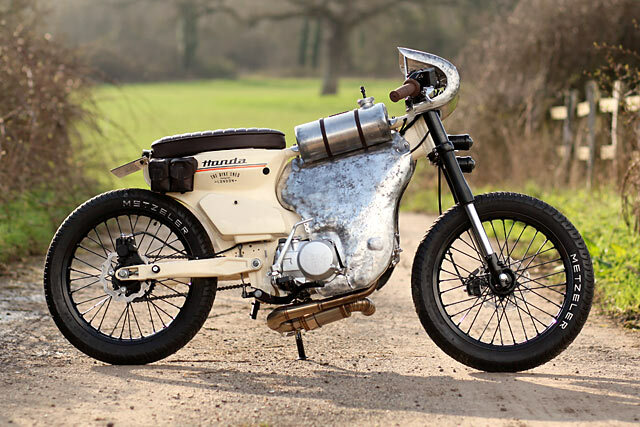 New alloy rims and some skinny Metzeler boots were also added alongside a fresh set of disc brakes front and rear.” Final touches included some Russian army ammo pouches, a handmade leather seat and a Koso tacho. 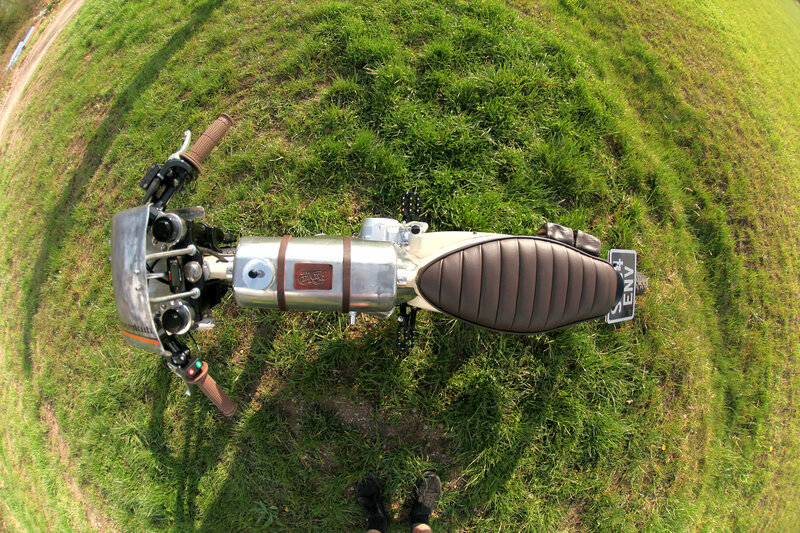 Then the bike was completely stripped down and powder coated in Pip’s signature cream. But a racer’s a racer, right? And racers need to go fast. So how fast can you go on a shoestring? 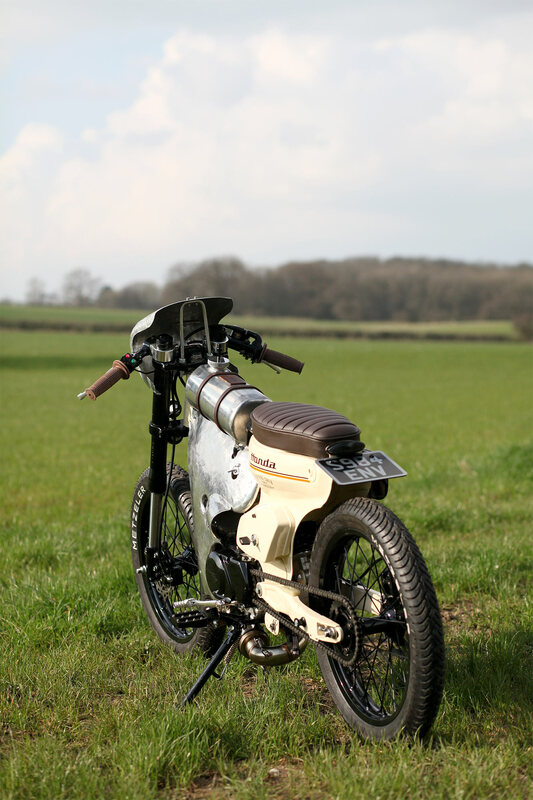 “I’ve had a GPS indicated 82 mph (131 km/h) out of her,” smiles Pip. Not too shabby. 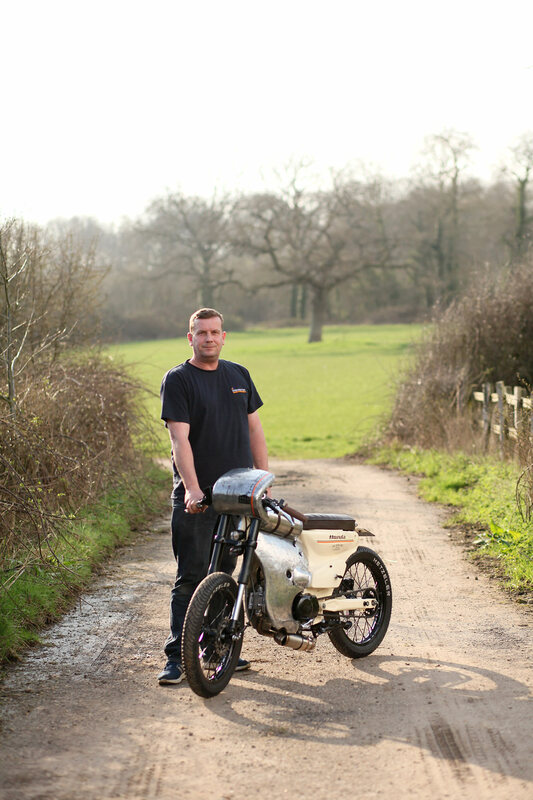 “As far as challenges go, setting up the rear brake was the main one. It’s usually a simple job, but there was very limited space between frame and swing arm to fit it all in. “For some reason, it was so fooking hard to bleed! exclaims Pip, grimacing. He also notes that his favourite part of the finished Honda is the raw, almost medieval, metal bodywork with its hammer marks left for all to see. 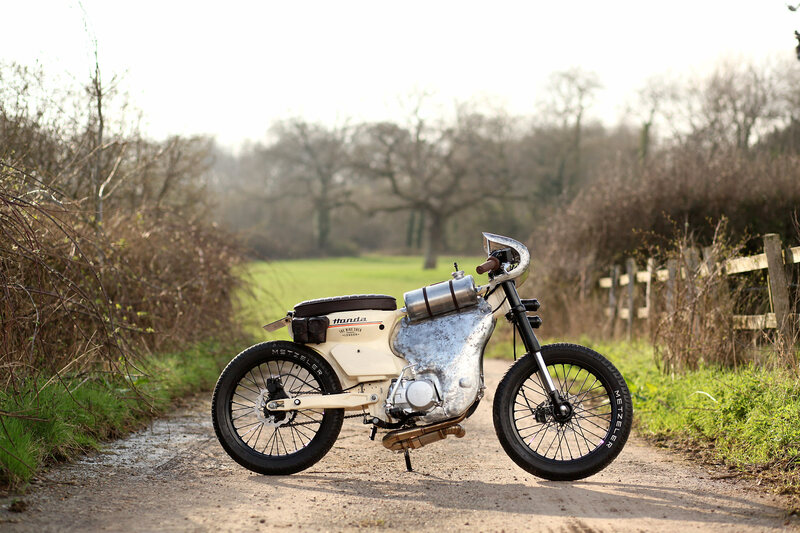 ‘Rough and ready’ is how we’d put it; almost like a 1940s land speed racer. 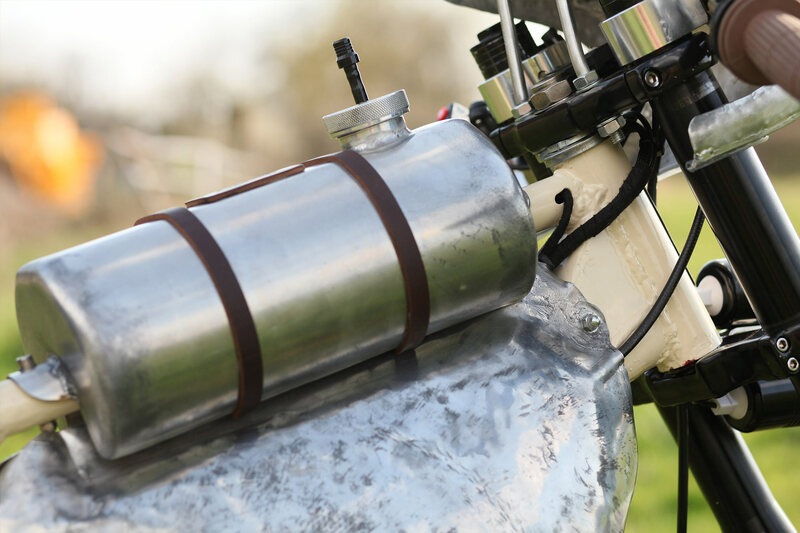 “I’m still seriously considering nitrous,” adds Pip. “It feels like it needs it.” Did someone say ‘strife’?